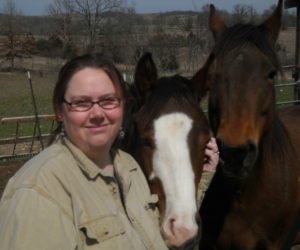 I live in the Ozarks along the Missouri/Arkansas border with my four very spoiled horses, a large mixed flock of chickens, geese, ducks, and guineas, enough cats to qualify me to be a crazy cat lady, and a loving husband who tolerates it all. My mom doesn’t understand how I grew up loving the English disciplines, when she grew up on Roy Rogers and the Lone Ranger. But she supported me, and I sold girl scout cookies to finance my way through four years of horse camp. Then, I cleaned stalls and worked in exchange for riding lessons. A bad fall has left me with a fear issue that I still hope to work through eventually. Yes, my horses are pasture ornaments, though we do groundwork together quite often. It wasn’t until August of 1999 that I owned my own horse. Fortune, a grade mare, was an “oops” foal out of a mare who had been in and out of the stock yards. I paid $100 for her. That’s her in the picture with Firefly, her pinto foal out of Thunder, one of my horses who was a gift to my mother. (Thunder was a stallion purchased for $200 from the seller of the property. I kept him intact for one heart foal.) My fourth horse is Holly, a rescue from a kill pen. We’re still getting to know one another, and I’m hoping Fortune, Firefly, and Thunder have convinced her that this is a good place to be a horse.